The Red Telescope came into existence through a mutation of the Ryukin, and further mutations led to the Calico Telescope. 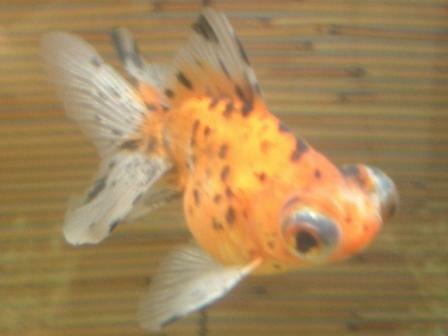 Using the Calico Telescope, new kinds of goldfish, such as the Oranda, the Shubunkin and the Calico Ryukin, have been bred. The Calico Telescope is an important goldfish in the genetic history of other goldfish. Its features are completely the same as the Telescope except for their body colors. It is mosaic-like, transparent scaled. Since its body colors are red, white, and black, it is called ‘Sanshoku Demekin’ which means ‘Tri-Color Telescope’ in Japanese. They are also called ‘Sanshiki Demekin’. Acquisition difficulties Normal. Compared to the Black Moor, trading volume is less, but acquisition is not that difficult. Rearing difficulties Normal. They are as strong as the Black Moor. However, you need to take care in protecting its protruded eyeballs. Details of the above photo The goldfish in the photo is a regular Telescope that can be found anywhere. Other Different from Japan, lots of eyeball-protruded goldfish are made in China such as Red cap Oranda and Oranda.